Employer guest post on success at networking events. Part 1 and Part 2 of how to follow up after a career event. If you missed these events, work with your graduate career consultant for ideas on how to get in the game after the fact. 1) STEM Coffee & Careers. This is a great opportunity for graduate students with STEM backgrounds to engage with employers in an informal setting to better understand their organizations, cultures, talent needs, and to showcase research and academic training. More details, including the list of registered organizations, can be found here. 10:30am-12:30pm Wednesday 9/5. 2) Fall Career Expo. Over 250 organizations are expected to attend this year’s Fall Career Expo from 4:30-8:30pm Wednesday 9/5. 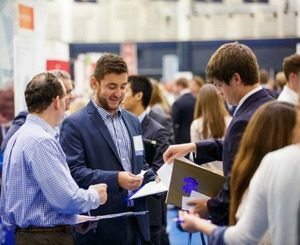 Find the list of companies in Go IRISH under Events à Career Fairs, and target 5-10 employers that you particularly want to speak with at the fair. 3) Employer Information Sessions. Throughout the fall semester, organizations come to campus to provide workshops with information about their opportunities, hiring processes, culture, etc. These are great ways to learn more about the companies and build relationships with recruiters, alumni, and other reps. The sessions are publicized in Go IRISH under Events à Information Sessions. 4) On-Campus Interviews. Throughout the fall semester, employers come to campus to interview candidates for their opportunities. While many of these will target undergraduate students, there are some for which graduate students are eligible. Search for jobs in Go IRISH (you can set up alerts to notify you when new ones get posted), and apply for any that interest you. Ones with on-campus interview schedules will be noted. Have you had success recently or in the past through these fall recruiting initiatives? Please share your stories and advice in the comments below.